The emerging field of meeting science (or meeting research) has been flourishing in recent years, as evidenced several edited volumes and special issues (Allen et al. 2015; de l’Estoile 2015; Brown, Reed & Yarrow [forthcoming]; Clarke, Wodak & Kwon [forthcoming]; Sandler & Thedvall [forthcoming], Svennevig 2012). The aim of this symposium is to foster dialogue in this highly interdisciplinary field and to build a network of scholars with a shared interest in face-to-face meetings. This symposium is the first attempt ever to bring together meeting researchers from all social sciences to create synergies and cross-fertilization between meetings related research that has so far taken place in relative isolation from each other. Participants come from disciplines such as social anthropology, organizational communication, sociology, workplace studies, linguistics, political science, psychology, management, and even applied IT (Group Support Systems). Allen, J. A., Lehmann-Willenbrock, N., & Rogelberg, S. G. (Eds.). (2015). The Cambridge handbook of meeting science. Cambridge Handbooks in Psychology. New York: Cambridge Univ. Press. Clarke, I., Wodak, R., & Kwon, W. (forthcoming). The Discourse of Strategy: Meetings Matter. Edinburgh: Edinburgh Univ. Press. Sandler, J., & Thedvall, R. (Eds.). (forthcoming). Meeting Ethnography: Meetings as Key Technologies of Contemporary Governance, Development, and Resistance. Abingdon: Routledge. Schwartzman, H. B. (1989). The meeting: Gatherings in organizations and communities. New York: Plenum Press. Svennevig, J. (Ed.). (2012). Special Issue on Interaction in Workplace Meetings. Discourse Studies, 14(1). The symposium will take place at the University of Gothenburg, Campus Haga, Sprängkullsgatan 23 (see map below) in room D205. Participants will be hosted at Hotel Scandic Rubinen located on Kungsportsavenyn. The symposium is organized by Christoph Haug (Senior Lecturer and Marie-Curie Fellow at the University of Gothenburg) with the assistance of an international advisory committee and with the financial support of Riksbankens Jubileumsfond, the Swedish Foundation for Humanities and Social Sciences and a Research Grant from the European Union’s 7th Framework Program (Marie Curie Actions). Click on the sessions in the schedule below for more details. Papers for the thematic sessions will be circulated in late April (deadline for submitting your paper is 24 April 2017). Please read them beforehand as they will not be presented). The papers in this session will be given as PechaKucha presentations (20 x 20 seconds) so there will be ample time for discussion. Since Schwartzman’s seminal book on The Meeting, scholars have increasingly attended to meetings as a topic of research in its own right. Criticizing common sense approaches that either ignore meetings or treat them as a tool to study other things (decision-making, problem solving, conflict etc.) Schwartzman managed to turn the familiar (and hence trivial) phenomenon of meetings into something interesting and worth studying. Today, meeting research includes studies of both kinds: while some are primarily interested in understanding and theorizing meetings, others are less focussed on the meeting itself but on various processes that include meetings such as collaboration, governance, or workplace communication. This symposium welcomes contributions from both strands of research and aims to foster the emerging interdisciplinary dialogue among researchers with a specific interest in meetings. 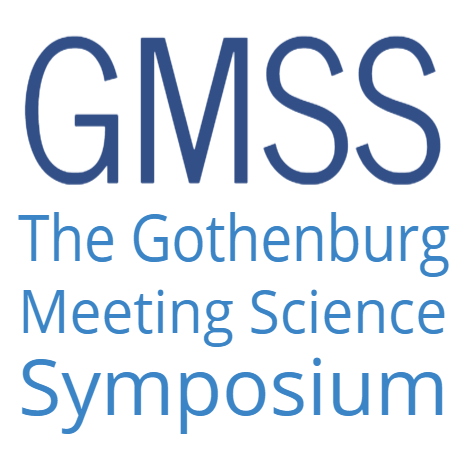 Apart from raising awareness of the multitude of existing approaches to meetings, the symposium provides an opportunity for collective reflection on the concept and phenomenon of meetings as well as on the emerging field of meeting science1. The following list of questions that might be discussed during the symposium is neither exhaustive nor compulsory. It is a tentative list to provide some orientation about the nature of discussions to be expected. What are those neighbouring concepts from which the meeting needs to be distinguished? Is there a consensus on the definition of the meeting? What definition do you use and why? How does the term meeting translate in other languages and what can be learned from the nuances of meaning? Is the notion of meetings a universal one (i.e., all meetings around the world have something in common) or are there different phenomena that look like meetings but don’t really have any core common features? What is/could/should be the role of meeting science (a) as an academic field of study (b) in relation to practitioners (such as meeting organizers and participants)? How is the study of meetings received in various established disciplines and fields of study? What difficulties are meeting researchers faced with when publishing their work or when applying for funding? What are the main questions that meeting scientists are trying to tackle – both in terms of “problematizing” and in terms of “gap spotting” (Sandberg & Alvesson 2011)? What do we already know about meetings? What common sense knowledge about meetings needs to be rectified? Which are the most underexplored areas of meeting science? Should meeting theory be seen as a theory about a specific empirical phenomenon or as a transversal perspective that can guide the study of virtually any social phenomenon (like, for instance, feminist theory)? How do you teach meeting science? How can meeting science enhance the teaching of “traditional” subjects? How does meeting science relate to the ubiquitous popular literature on “How to have better meetings”? How to identify suitable publication outlets for studies on meetings? Sandberg, J., & Alvesson, M. (2011). Ways of constructing research questions: gap-spotting or problematization? Organization, 18(1), 23–44. Schwartzman, H.B., 1989. The Meeting, Plenum Press. Christoph Haug samlar forskare från hela världen som på olika sätt intresserar sig för möten.